Uncannily empty on a Saturday evening, when all other Wakefield pubs were heaving. Friendly barman and customers. A genuine pub but very scruffy. No sign of food in the evening, but a good range of beers. Good pint of Landlord (2.75/pt) and a nice beer garden to the rear. Traditional city centre pub, on the quieter side of Wakefield. It�s warmly and richly decorated, but the horseshoe shaped interior is perhaps let down by a rather under-whelming bar. Two real ales: Tetley Bitter and Timothy Taylor�s �Landlord�. The �Landlord� was served at a decent temperature, but wasn�t the freshest. I suspect turnover is very limited, as the place was absolutely dead when I called on a Thursday evening. Just five people in the place. Being sandwiched geographically between the Fernandes Tap and the Six Chimneys probably doesn�t help. Limited, but interesting looking, lunchtime menu. 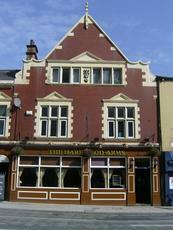 A pub with huge potential.